You will see the work we have done, not the mess we have left. We have experience in all aspects of joinery and carpentry from small jobs such as changing locks or trimming doors to full house builds and complex project management. As a Main Contractor, we can supply all trades for your specific project requirements. We can supply all trades for your specific project requirements. Service can be arranged as required. If required, our team can provide extensive expertise in project management and delivery from design conception and development, procurement, execution and successful handover. We are fully insured in all aspects of joinery work and kitchen installation. We have been established in the Aberdeen area for over 19 years and we are currently one of the Aberdeen’s most reputable companies. We provide a wide range of services from jobbing joinery to kitchen installation timber kit erections. Please feel free to browse our website to find out more about what we can offer. Get in touch now to receive a no obligation quote for your project. 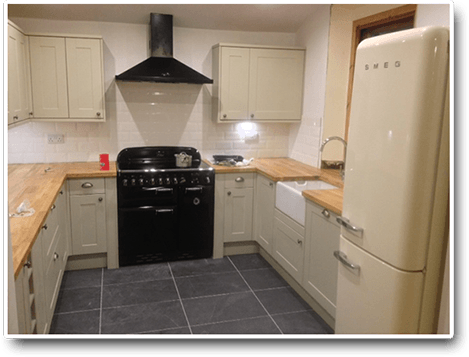 The joinery work was carried out in a very professional manner and was finished to a very high standard, in addition the affected areas were left as clean and tidy as possible at the end of each day, which was extremely important when having to live within in an extension project. We would have no hesitation in the future in asking him to work for us. Gus supplied an oak staircase giving access to our bedrooms which has become the focal point in our hall.